For the modern encyclopedic view of the “Sect of antient Philosophers” known as Pythagoreans, see the Wikipedia article, s.v. Pythagoras and the Wikipedia article, s.v. Pythagoreanism. The exalted, and awe-inspiring figure of Pythagoras is memorialized in the frontispiece engraving by John Sturt (1658–1730) — after that of Sébastien Leclerc (1637–1714) — which is prefixed to the 1st edn. of Chambers’ Cyclopaedia (1728). In the Cyclopaedia frontispiece, Pythagoras is depicted as a founding father of modern science, and leads the row of busts named for Pythagoras, Epicurus, Plato, Descartes, and Newton. Leclerc’s original engraving, L’Académie des sciences et des beaux-arts (1698), was inspired by Raphael’s early-16th-century fresco, The School of Athens (see bottom left for details), which was anonymously engraved and widely circulated as a print (The Gymnasium or Academy of the Athenian Philosophers) during the 17th century. For more on all this, see the updated version of our Gallery Exhibit on Chambers’ Cyclopaedia (forthcoming), and also Lawrence Miller’s detailed study of the Cyclopaedia frontispiece. Pictures of Raphael’s fresco depicting Law or Justice (another in the series of four wall frescos in Raphael’s Stanza della Segnatura, for Vatican Palace, Vatican City, 1508–12) are prefixed to She-philosopher.​com’s study of California’s flawed “Good Neighbor Fence Act of 2013” (Assembly Bill 1404 or AB 1404), under which long-time California property owners have lost rights & security. For more on “the mystic Pythagoras, a figure reverenced in 17th-century Europe and the Near East” and his influence within England’s new science movement, see the introductory essay on Robert Hooke in the PLAYERS section. For more re. the continuing influence of Pythagoras in the 21st century, see the PBS NewsHour feature, “From the Big Bang to Cosmic Vibrations, Grateful Dead’s Mickey Hart Plays the Rhythm of the Universe” (originally aired 2 July 2015). For a brief discussion of women Pythagoreans, see She-philosopher.​com’s “What’s in a Name?” Web page. Other articles from Chambers’s Cyclopædia, or, an Universal Dictionary of Arts and Sciences (1728) are available as digital editions in the She-philosopher.​com Library. For a detailed discussion of Thomas Tryon’s Pythagorean lifestyle and beliefs — “matters highly philosophical, physiological, Pythagorical and medicinal” — see the editor’s introduction to the digital reissue (2014) of Tryon’s The Planter’s Speech to his Neighbours & Country-Men of Pennsylvania, East & West-Jersey ... (1684) at the subdomain known as Roses. An appendix to this editor’s introduction describes the Pythagorean practice of “Medicine by Musick” as interpreted by a 17th-century commentator. See also that website’s illustrated webessay on Thomas Tryon’s A Dialogue Between an East-Indian Brackmanny or Heathen-Philosopher, and a French Gentleman Concerning the Present Affairs of Europe (1683), with discussion of Tryon’s Averroeana: Being a Transcript of Several Letters from Averroes ... to Metrodorus ... Also Several Letters from Pythagoras to the King of India ... (1695). In his op-ed, Desch also punctures lingering stereotypes about the scientific method, rightly describing science as a complex human endeavor which employs “logic, insight, creativity and experimentation” (S. Desch, B7). • Los Angeles Times op-ed, “Dying Ethically: We Owe It to Doctors and the Terminally Ill to End the Hippocratic Oath’s Grip on the End of Life,” by Nora Zamichow and Ken Murray (28 December 2014 newspaper, p. A20) ¶ For more questions concerning modern medicine’s reliance on Hippocratic ethics, see the sidebar on “Complexities and contradictions inherent in any revived Hippocratism today” at the subdomain known as Roses. ¶ This same website introduces a now little-known, but influential, early-modern perspective on the Hippocratic ideal with its sidebar explaining Joan Baptista van Helmont’s revived Hippocratism in the 17th century. There are 4 “hover” boxes used on this Web page. I give below an HTML transcription of the article on Pythagoras and Pythagoreans written by England’s foremost encyclopedist, Ephraim Chambers (1680?–1740), for the first edition of his Cyclopædia, or, an Universal Dictionary of Arts and Sciences (2 volumes, 1728). Pythagorean doctrine had enduring influence on developments in 17th-century philosophicoreligious thought, impacting Fellows of the Royal Society of London for the Improving of Natural Knowledge, such as the scientist and engineer Robert Hooke; mystics and Behemists, such as the health-care crusader Thomas Tryon; radical puritan movements, such as the Anabaptists and Quakers; and even public-policy debates over wise government and growth of the Anglo-American colonies. Pythagorean teachings permeated the early-modern respublica literaria despite the fact that, as Chambers comments in his encyclopedia article, “Pythagoras never committed any thing to Writing.” This left 17th-century popularizers such as Thomas Tryon (1634–1703) free to refashion Pythagorean teachings for the early-modern age of globalization as he saw fit. Accordingly, Tryon made Pythagoreanism the framework for a program of zealous social reform, and promoted the heroic stature of Pythagoras of Samos (b. c. 570 BCE–d. c. 480 BCE). Mankind with one consent agree that [Pythagoras] was a Person endued with Antient Morals, and Sincere Fidelity, affecting neither the Applause nor Estimation of the Vulgar, having only a particular regard to the Welfare of Mankind, not stuffing his Writings with Rhetorical Flights to captivate the Understanding of the Ignorant, always commending many wholesom Rules, and useful Notions, to the Service of the World. So that it seems he was altogether bent to promote the Health and Welfare both of Body and Mind. What need is there to say more, so many Excellent Things have been Written by him, and with so many Praises have all the Learned in former Ages extolled him, that it would be highly unreasonable to suspect the Reputation of so great a Man. The 17th-century fascination with Pythagorean science and the Pythagorean lifestyle, however mythically reconstrued by popularizers like Tryon, continues to influence us. And that makes Chambers’ early-18th-century summation of what was then thought about the still-mysterious ancient sect of Pythagoreans worth reading today. PYTHAGOREANS, a Sect of antient Philosophers, who retain’d to the Doctrines of Pythagoras. See PHILOSOPHER. “ The Founder of this Sect was of Samos, the Son of a Lapidary, and Pupil of Pherycides; who flourish’d about the seventh Olympiad, i.e. about 500 Years before Christ. “ This Sect was also call’d the Italic Sect, or Italic School, because Pythagoras, after travelling into Egypt, Chaldea, and even into the Indies, to inform his Understanding; returning home to his own Country, and there unable to bear the Tyranny of Polycrates, or Solison, retir’d into the Eastern Part of Italy, then call’d the Greater Greece, and there taught and form’d his Sect. See IONIC. “ He is held to have excell’d in every part of Science: Laertius says, among the Chaldees and Hebrews he learnt Divination, and the Interpreting of Dreams; in Egypt he learnt all the Mysteries of the Priests, and the whole System of Symbolical Knowledge, with all their Theology———Porphyry adds, that he learnt the Mathematical Sciences in his Travels; Geometry from the Egyptians, the Doctrine of Numbers and Proportions from the Phoenicians, and Astronomy from the Chaldeans; Morality, and Theology he learnt chiefly from the Magi. “ He was the first who assum’d the Title Philosopher; the Sages till his time having bore the arrogant Title . See PHILOSOPHER. “ Jamblicus observes, that in Phoenicia he conversed with the Prophets and Philosophers, the Successors of Mochus the Physiologist; which Mochus, Selden and some others will have to be Moses. “ His School in Italy was at Crotona; where he is said to have been attended by no less than 600 Scholars—His House was call’d the Temple of Ceres, and the Street where it stood the Musaeum. See MUSAEUM. “ Out of his School proceeded the greatest Philosophers and Legislators, Zaleucus, Charonidas, Archytas———Porphyry says, as soon as he arriv’d in Italy he had an Auditory of two thousand People; to whom he explain’d the Laws of Nature, Reason, and Justice. “ He endeavour’d to assuage the Passions of the Mind with Verses, and Numbers; and made a Practice of composing his Mind every Morning by his Harp; frequently singing the Paeans of Thales. See MUSIC. “ Exercises of the Body made a considerable part of his Discipline. See GYMNASTIC Exercise. “ His School became so popular, that Cities and People committed their Republics to the Government of his Scholars———At length, Porphyry adds, Envy stirring up Sedition against ’em, they were oppress’d; and in time, their Learning, which they ever kept secret, was lost; except some difficult things learnt by Rote by the Crowd of Hearers. For Pythagoras never committed any thing to Writing. “ Beside his public School, Pythagoras had a College in his own House, which he call’d , Coenobium: In this were two Orders or Classes of Scholars, , Exoterici, call’d also Auscultantes; and , Intrinseci.———The former were Novices and Probationers, who were kept under a long Examen, and even imposed a Quinquennial Silence, to teach them Modesty and Attention, according to Apuleius; or, according to Clemens Alexandrinus, to teach them to abstract their Minds from sensible Objects, and enure them to the pure Contemplation of the Deity. “ The latter were call’d Genuini, Perfecti, Mathematici, and Pythagoreans, by way of Eminence———These alone were let into the Arcana and Depths of the real Pythagoric Discipline. “ Clemens observes, that these Orders corresponded very exactly to those among the Hebrews: For in the Schools of the Prophets were two Orders, viz. the Sons of the Prophets, who were the Scholars; and the Doctors or Masters, who were also call’d Perfecti. And among the Levites, the Novices or Tyro’s, who had their Quinquennial Exercises, by way of Preparation. Lastly, even among the Proselytes there were two Orders; Exoterici, or Proselytes of the Gate; and Intrinseci or Perfecti, or Proselytes of the Covenant. He adds, ’tis highly probable that Pythagoras himself had been a Proselyte of the Gate, if not of the Covenant. See PROPHECY. “ Gale endeavours to prove, that Pythagoras borrow’d his Philosophy from that of the Jews; to this end producing the Authorities of many of the Fathers, and antient Authors; and even pointing out the Tracks and Footsteps of Moses in several parts of Pythagoras’s Doctrine. “ Pythagoras taught, 1. That God is one; that he is a most simple, incorruptible, and invisible Being; and therefore only to be worshipped with a pure Mind, with the simplest Rites, and those prescribed by himself. “ Laertius observes, that he made Unity the Principle of all things; hence arose Duality, &c. See UNITY, &c.
“ In his Conversation with the Egyptians, he learnt abundance of Secrets about Numbers; to which he attributed so much, that he even attempted to explain all things in Nature by Numbers———In effect, it was a common Opinion of the antient Philosophers, that the Species of Things have to each other the Nature and Relation of Numbers; and that the Universe, and all Things therein, were produced according to certain Numbers, inherent in the Creator’s Mind. See CREATOR. “ Hence Porphyry observes, the Pythagoreans studied the Doctrine of Numbers with great Attention: Since the incorporeal Forms, and first Principles of Things, i.e. the Divine Ideas, could not be deliver’d in Words, they had recourse to Demonstration by Numbers; and thus call’d the common Reason and Cause of Unity, Identity, and Equality, by the Name One. “ 2. Pythagoras further taught, that there is a Relation or Kin-ship between the Gods and Man; and therefore the Gods take care of Man———Which, Clemens Alexandrinus says, is apparently borrow’d from the Christian Doctrine of Providence. See PROVIDENCE. “ Pythagoras also asserted a Metempsychosis, or Transmigration of Souls; and therefore the immortality of the Soul. See METEMPSYCHOSIS. “ 3. He taught, that Virtue is Harmony, Health, and every good thing; and that God, and therefore every thing, consists of Harmony. See HARMONY. “ PYTHAGOREAN, or PYTHAGORIC System, among the Antients, was the same with the Copernican System among the Moderns. See SYSTEM. “ It was thus call’d, as having been maintained and cultivated by Pythagoras, and his Followers; not that it was invented by him, for it was much older. See COPERNICAN System. “ PYTHAGORIC Theorem, or Proposition, is the 47th of the first Book of Euclid. See TRIANGLE and HYPOTHENUSE. “ PYTHAGORIC Tetractys. See TETRACTYS. SOURCE: Ephraim Chambers, “Pythagoreans.” In Cyclopædia, or, an universal dictionary of arts and sciences. Containing the definitions of the terms, and accounts of the things signify’d thereby, in the several arts, both liberal and mechanical, and the several sciences, human and divine: the figures, kinds, properties, productions, preparations, and uses, of things natural and artificial: the rise, progress, and state of things ecclesiastical, civil, military, and commercial: with the several systems, sects, opinions, &c. among philosophers, divines, mathematicians, physicians, antiquaries, criticks, &c: the whole intended as a course of antient and modern learning. Compiled from the best authors, dictionaries, journals, memoirs, transactions, ephemerides, &c. in several languages, by E. Chambers. 2 vols. London: Printed for J. and J. Knapton [and 18 others], 1728. 2.921. 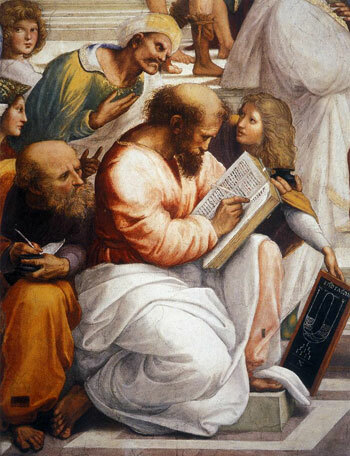 An introductory note for the images which follow: I long ago identified the figure I believe to be the true Pythagoras in Rafael’s celebrated fresco, The School of Athens (c.1509–11). But my (sure to be surprising! ;-) identification relies on little-known, 17th-century sources & texts which I have not yet finished digitizing for publication here. Without this new evidence at hand, which everyone is able to review for themselves, I can’t make a proper — able to withstand the rigors of peer review in today’s digital respublica literaria — scholarly argument. So further public announcements on this matter are going to have to wait, as I attend to other, more time-critical projects first. ^ The Pythagoreans. Detail No. 1 from Raphael’s celebrated The School of Athens — a fresco, dating from c.1509–11, on the wall of the Stanza della Segnatura (Vatican Palace, Rome). 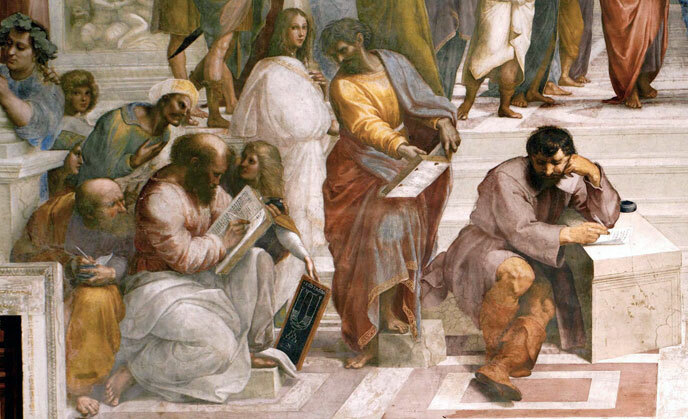 Scholars continue to debate which figure in Raphael’s School of Athens depicts Pythagoras. 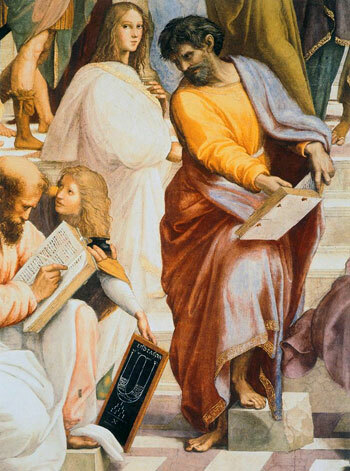 Traditionally, he has been thought to be represented here as the man who discovered the harmonic scale (figure on the left, dressed in pink and white, shown writing in a book, while a youth holds a slate before him inscribed with his theory of harmony). 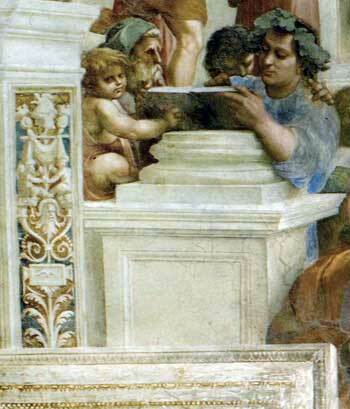 But Edgar Wind makes a compelling argument that Raphael chose to feature a different aspect of the mystic philosopher: “the silent Pythagoras,” here represented as the bearded man in the center foreground of the fresco, shown leaning against a block of marble, brooding alone, and “generally misnamed Heraclitus” (E. Wind, Pagan Mysteries in the Renaissance, 54n4). < Pythagoras (or an unidentified student/disciple of Pythagoras, possibly Philolaus). Detail No. 2 from The School of Athens (c.1509–11), Stanza della Segnatura fresco (Vatican Palace, Rome). By Raffaello Sanzio da Urbino (1483–1520). 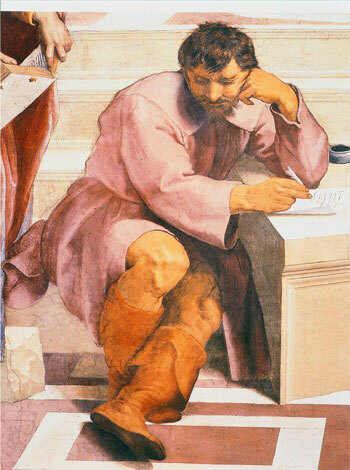 Such an ahistorical view of Pythagoras is especially jarring from Raphael, long regarded as an exceptionally learned man, a good historian, “and generally skill’d in the best Antiquities” (J. Evelyn, Translator’s Preface, An Idea of the Perfection of Painting ... Written in French by Roland Freart, Sieur de Cambray, and Rendred English by J. E. Esquire, Fellow of the Royal Society, 1668, b6v). Given the visual emphasis here on the written word, I would suggest that this figure is better understood as a representation of Philolaus (b. c. 480 BCE) — an eminent mystic and philosopher of the Pythagorean school, and possibly the first to publish Pythagorean views for the general public. During the age of scientific revolution, Philolaus was known as the first European “who Asserted the Sun to be the Center of the Universe; and that all the Planets, and the Earth among the rest, which must therefore be esteemed one of them, moved round about it, that remaining fixt.” (R. Hooke, Posthumous Works, ed. Richard Waller, 1705, 105) When Raphael’s contemporary, Nicolas Copernicus (1473–1543), similarly posited two thousand years after Philolaus that the earth and planets moved about the sun, the Copernican theory of the universe was denounced as a Pythagorean heresy. < “Il pensieroso” (The Thoughtful One; alternately identified as Heraclitus, Pythagoras, and Epicurus). Detail No. 3 from The School of Athens (c.1509–11), Stanza della Segnatura fresco (Vatican Palace, Rome). By Raffaello Sanzio da Urbino (1483–1520). But Raphael’s bearded man, leaning against a block of marble, is not weeping, and is more thoughtful than melancholy. I, too, do not believe that this is Heraclitus. Edgar Wind’s identification of Raphael’s “Il pensieroso” as Pythagoras is discussed above (see caption for Detail No. 1). The alternate identification of this pensive figure as Epicurus dates from the 17th century, having been suggested by the early-modern art critic and connoisseur Roland Fréart (1606–1676), sieur de Chambray, in his Idée de la Perfection de la Peinture (Le Mans, 1662). Fréart’s commentary, as Englished by John Evelyn, reads: “... One might farther believe, and that with greater probability, (with respect to the Synchronisme) that this Figure situated in the middle of the piece, and just before the Plan, in so pensive and melancholy a posture, leaning his head upon his arme, and reposing his elbow on the corner of a Table, [were] the Philosopher Epicurus, who wrote his Testament in a Letter which he addres’d to Idomenaeus his intimate friend, as Diogenes Laertius reports; because it was the very last of his Actions, and, indeed, the most stupendious; since being then attacq’d with a Paroxysme of that most inconceivable torment of the Stone (of which he soon after dyed) he remitted nothing of his accustom’d Tranquillity of Spirit, but reason’d, and discours’d to the last minute, in the same manner as he was wont to do, when he enjoy’d the greatest health; which abundantly testifies, that the Sentiments, and Precepts of this great man, were not such as the vulgar reported, or that the Pleasure which he styl’d the Soveraign-Good, consisted in that shameful and voluptuous satisfaction which some have described.” (J. Evelyn, An Idea of the Perfection of Painting ... Written in French by Roland Freart, Sieur de Cambray, and Rendred English by J. E. Esquire, Fellow of the Royal Society, 1668, 116–7). It is not difficult to believe Raphael shared this perspective, and is here exploring Epicurus’s celebrated resolve to embrace, rather than fear, death. < Also identified as Epicurus. Detail No. 4 from The School of Athens (c.1509–11), Stanza della Segnatura fresco (Vatican Palace, Rome). By Raffaello Sanzio da Urbino (1483–1520). < Hindu philosopher. Detail No. 5 from The School of Athens (c.1509–11), Stanza della Segnatura fresco (Vatican Palace, Rome). By Raffaello Sanzio da Urbino (1483–1520). Raphael is here acknowledging the cross-cultural influences within Pythagoreanism. Early-modern Europeans such as Thomas Tryon believed that, while in India, Pythagoras developed a large following: “... this great man travelling for the acquest and diffusion of Knowledge into divers parts, left not our India unvisited, and there planted this wholsom Doctrine [i.e., vegetarianism], which ever since hath not wanted Observers, derived down by a continual Succession to our Times.” (T. Tryon, A Dialogue Between an East-Indian Brackmanny or Heathen-Philosopher, and a French Gentleman Concerning the Present Affairs of Europe, 1683, 18) Regardless of who taught whom the practice of principled vegetarianism, there is no doubt that both Greek and Hindu cultures cross-pollinated the Pythagorean school of natural philosophy. “Because the humanist position concerning these symbola was molded by Neo-platonists, especially Jamblichos and Porphyry, and by early Christian fathers such as Jerome and Clement, the Pythagorean sayings were considered allegories designed to be intelligible only to the initiated. Not only did Pythagoras remain respected by Christians for his mathematical and musical theories, but his cult with its division of students into the esoteric, or those who had earned the right to take part in discussions led by Pythagoras within a veiled enclosure, and the exoteric, or those neophytes who kept silent and listened from without, was believed to have been a precursor of Christian monasticism.... By the same token, legendary accounts (in Isocrates, Plato, Herodotus, and others) of the journeys of Pythagoras to Egypt, the Middle and Far East, and even Europe in a quest for the teachings of Egyptian and Chaldean priests, Persians, Arabs, Hebrews, Hindus, and Druids only served to increase the respect of the Renaissance syncretists for the Pythagorean symbola. This Web page was last modified on: 04/04/2019 2:14 AM.